The Triton decompression/traction device used in our office provides a treatment in static, intermittent and cyclic distraction forces to relieve pressure on structures that may be causing pain of skeletal or muscular origin (cervical, thoracic, lumbar, hip, wrist, shoulder). Therapeutic distraction can be applied in a variety of programmable patterns, cycles and functions. The decompression device achieves these effects through mechanical traction of intervertebral discs, that is, unloading due to distraction and positioning. The computer is the key. It controls the variations in the traction pull allowing for spinal decompression and eliminating muscle guarding that is typical in conventional traction devices. The preprogrammed patterns for ramping up and down the amount of axial distraction allows for higher levels of spinal decompression and disc rehydration. Spinal decompresion therapy is a non-surgical, traction-based treatment that uses a computerized guided pulley system to cycle through distraction and relaxation phases to gently spearate the bones of the spine. A specific spinal segment can be isolated and placed under a negative pressure gradient, causing a vacuum effect within the disc. The disc material that has protruded or herniated outside the normal confines of the disc can be pulled back within the disc, thus taking pressure off the surrounding pain sensitive nerves. In addition to relieving nerve irritation, decompression therapy increases circulation to the disc which stimulates healing within the injured tissues. Our system offers additional options that many of the other systems do not. 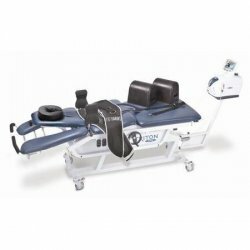 In addition to lumbar traction, our system is also capable of performing cervical decompression traction. Treatment time differs for each patient due to their condition and the severity of the condition, so your number of treatments may vary.